Hydroboration revisited – and more complicated! In a previous post, I described the work of Singleton on a simple hydroboration reaction. He found less regioselectivity than predicted by transition state theory. Further, trajectory computations suggested that dynamic effects were at play, and that some non-selective fast reactions were leading to the lower regioselection. Pilling offers an alternative explanation based solely on RRKM (statistical) theory.1 (Actually what is utilized is the stochastic energy grained master equation.) What he suggests is that there are hot intermediates (formed of a loose associate of BH3 with propene) that react non-selectively before cooling. The cooled intermediates react very selectively (around 99%) to give the anti-Markovnikov product. The upshot is that hydroboration – and by implication a whole lot of other seemingly ordinary chemistry – may in fact be much more complicated than we had previously thought. Standard transition state theory may not always apply, and trajectory analysis may not be enough! Has a cyclobutadiene species been isolated? Earlier this year, Barboiu made the astonishing claim of the x-ray characterization of 1,3-dimethylcyclobutadiene, brought about by the photolysis of 4,6-dimethyl-α-pyrone encapsulated in a guanidinium-sulfonate-calixarene crystal (Reaction 1).1 I had not blogged on this paper because Henry Rzepa did a quite thorough analysis of it in this blog post. Now, a couple of rebuttals have appeared and it is time to examine this study. 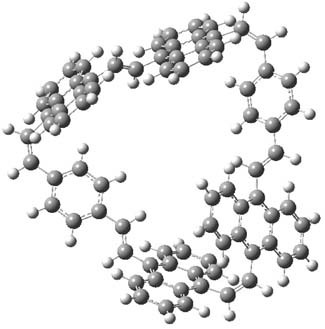 Alabugin calls in question whether the reaction has in fact proceeded beyond 2.2 They note that in the x-ray crystal structure, the distance between a carbon of the purported cyclobutadiene ring and the carbon of CO2 is only 1.50 and 1.61 Å. Barboiu called this a “strong van der Waals contact”, but this is a distance much more attributable to a covalent bond. In fact, the shorter distance is in fact shorter than some of the other C-C distances in the structure that Barboiu calls covalent! Perhaps more bizarre is that the putative CO2 fragment is highly bent: 119.9&;deg;, a value inconsistent with CO2 but perfectly ordinary for an sp2 carbon. 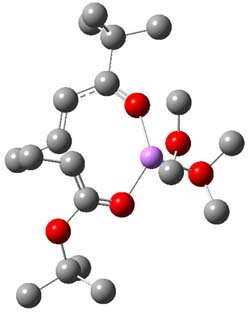 In fact, B3LYP/6-31G** computations suggest that bending CO2 this much costs about 75 kcal mol-1 – and tack on another 7 kcal mol-1 to make the two C-O distances unequal (as found in the x-ray structure!). Thus, Alabugin suggests that only 2 has been formed, and notes that the cleavage to 3 would likely require light of much higher energy that that used in the Barboiu experiment. Scheschkewitz argues that the x-ray data can be better interpreted as suggesting only the Dewar β-lactone 2 is present, though in its two enantiomeric forms.3 There is no evidence, he suggests of any cyclobutadiene component at all. It should be noted that Barboiu stands4 by his original work and original assignment, claiming that these types of x-ray experiments are quite difficult and large error bars in atom positions are inherent to the study. Henry Rzepa has blogged again on this controversy and has a paper coming out on this soon. I shall update when it appears. Henry notes in one of the comments to his blog that a TD-DFT computations does show that the Dewar β-lactone 2 is transparent from 320-500nm. 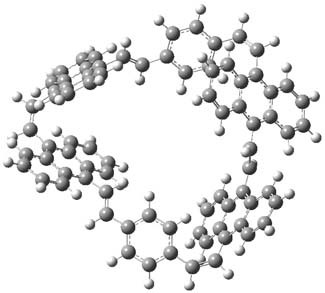 (1) Legrand, Y.-M.; van der Lee, A.; Barboiu, M., "Single-Crystal X-ray Structure of 1,3-Dimethylcyclobutadiene by Confinement in a Crystalline Matrix," Science 2010, 329, 299-302, DOI: 10.1126/science.1188002. (2) Alabugin, I. V.; Gold, B.; Shatruk, M.; Kovnir, K., "Comment on "Single-Crystal X-ray Structure of 1,3-Dimethylcyclobutadiene by Confinement in a Crystalline Matrix"," Science, 330, 1047, DOI: 10.1126/science.1196188. 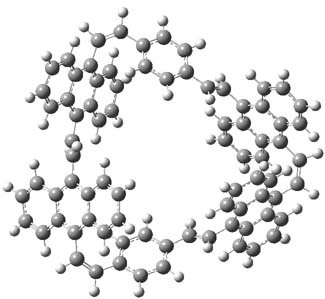 (3) Scheschkewitz, D., "Comment on "Single-Crystal X-ray Structure of 1,3-Dimethylcyclobutadiene by Confinement in a Crystalline Matrix"," Science 2010, 330, 1047, DOI: 10.1126/science.1195752. (4) Legrand, Y.-M.; van der Lee, A.; Barboiu, M., "Response to Comments on "Single-Crystal X-ray Structure of 1,3-Dimethylcyclobutadiene by Confinement in a Crystalline Matrix"," Science, 330, 1047, DOI: 10.1126/science.1195846. Heathcock’s model for predicting the stereo-outcome of Michael additions1 involves a metal bridging across the two carbonyl oxygens. For Reaction 1, the model predicts that 1,2-syn product over the 1,2-anti product based on more favorable steric arrangements in TSA relative to TSB. Note that other rotatamers of these TS models are possible, but are presumed to be less favorable due to the inability of the metal cation to bridge the carbonyls. In fact, the syn:trans ratio for Reaction 1 is 95:5. Kwan and Evans have examined this (and related) reactions at the M05-2x/6-31G(d) level.2 Dimethyl ether is used as the model for the solvent. The lowest energy transition state for Reaction 1 is TS1, shown in Figure 1 with suppressed drawing of the hydrogens (though the JMol active image will include the hydrogens). 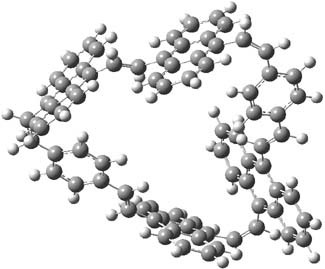 This structure is actually more like TSC, a rotamer that was thought to not have a bridging metal. TS1 does have the bridging metal, and this is accomplished by having dihedral values of 40° instead of the ideal 60°. So, computations support the general conclusion of the Heathcock approach, with a modification of the possible inclusion of some other rotamers, though the stereoprediction is not altered. Figure 1. M05-2x/6-31G(d) optimized structure of the lowest energy transition state of Reaction 1. Hydrogens are removed in the image for clarity, but the Jmol active image (which you can see by clicking on the above image) will include the hydrogen atoms. (1) Oare, D. A.; Heathcock, C. H. In Topics in Stereochemistry; Eliel, E. L., Wilen, S. H., Eds. ; Wiley: New York, 1989; Vol. 19, p 227-408. Reaction 1) is underestimated by HF, and slightly overestimated by MP2, but SCS-MP2 provides energy in nice agreement with CCSD(T)/CBS energies. Since MP2 adds in coulomb correlation to the HF energy (which treats exchange exactly within a one determinant wavefunction), the traditional wavefunction approach strongly suggests a correlation error. Next, bond separation energies computed with PBE and BLYP (which lack exact exchange), PBE0 (which has 25% non-local exchange) and BHLYP (which has 50% non-local exchange) are all similar and systematically too small. So, exchange cannot be the culprit. It must be correlation. He also makes two other interesting points. First, inclusion of a long-range correction – his recently proposed D3 method4 – significantly improves results, but the bond separation energies are still underestimated. It is only with the double-hybrid functional B2PLYP and B2GPPLYP that very good bond separation energies are obtained. And these methods do address the medium-range correlation issue. Lastly, Grimme notes that use of zero-point vibrational energy corrected values or enthalpies based on a single conformation are problematic, especially as the alkanes become large. Anharmonic corrections become critical as does inclusion of multiple conformations with increasing size of the molecules. (2) Brittain, D. R. B.; Lin, C. Y.; Gilbert, A. T. B.; Izgorodina, E. I.; Gill, P. M. W.; Coote, M. L., "The role of exchange in systematic DFT errors for some organic reactions," Phys. Chem. Chem. Phys., 2009, DOI: 10.1039/b818412g. (4) Grimme, S.; Antony, J.; Ehrlich, S.; Krieg, H., "A consistent and accurate ab initio parametrization of density functional dispersion correction (DFT-D) for the 94 elements H-Pu," J. Chem. Phys., 2010, 132, 154104, DOI: 10.1063/1.3382344. 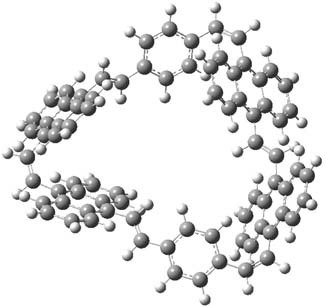 Herges has prepared the 36-annulene 1 where the anthracenyl units were introduced to force the loop out of plane.2 Four different conformations of 1 where isolated by crystallization out of different solvents. 1a and 1b were produced in benzene, and they differ by having two half-twists (Lk=2) and one half-twist (Lk=1), respectively. 1c was isolated from DMF, with one half-twist. 1d was isolated from Et2O/CH2Cl2. Computations at the B3LYP/6-31g* level identified 10 low lying conformations, and the ones corresponding to the experimentally observed forms are shown in Figure 1. The computed conformer that matches with 1d differs form the experimental version by a rotation about one single bond, and the computed version has a different topology than the experiment. One item of note is that all of the 10 computed conformers are dominated by the twist (Tw) and have very small writhe. Figure 1. B3LYP/6-31G* optimized structures of 1a-e. Though not isolated in experiment, one of the low lying conformers has three half-twists (Lk=3) and is also shown in Figure 1 as 1e. Identification of this highly twisted species would be quite interesting. (1) Fowler, P. W.; Rzepa, H. S., "Aromaticity rules for cycles with arbitrary numbers of half-twists," Phys. Chem. Chem. Phys., 2006, 8, 1775-1777, DOI: 10.1039/b601655c.